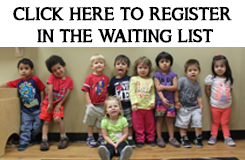 The admission process begins with a submission on the Waiting List on the www.kiddielandece.com home page. Families enrolled on our Waiting List will be contacted to schedule a Tour to view our facility and have questions answered regarding our program, policies, and procedures. Tours for parents are scheduled between 7:00 AM to 11:00 AM Monday through Friday. Special accommodations may be granted upon request to suit families’ work schedules. After the family decides to enroll their child(ren) in our program, application forms can easily be obtained at www.kiddielandece.com under Admission/Application Forms. An admission meeting will be scheduled to submit the completed and signed enrollment forms, along with a payment equivalent to the first month of tuition, and a two weeks refundable deposit. Families wishing to secure a spot for a future date may do so by leaving a two weeks deposit. Registration starts each May for the beginning of our school year in September but enrollment is open year round based on availability. Children can enroll full time or part time as capacity allows. Children currently enrolled in five days, full time programs have priority registration. To start the enrollment process, please complete and return all of the required paperwork. We must have a complete file on children prior to enrollment. Children’s file must include but not limited to the following forms and documents. All families, new and returning, must complete the registration process by August 15th of each year. Full-Day Summer Camp registration begins March 1st and ends April 30th. * Subsidized DCFS Voucher for guard of the state’s parents accepted. * Child Care Aware of America’s Military Fee Assistance Program accepted. * Special needs children accepted.